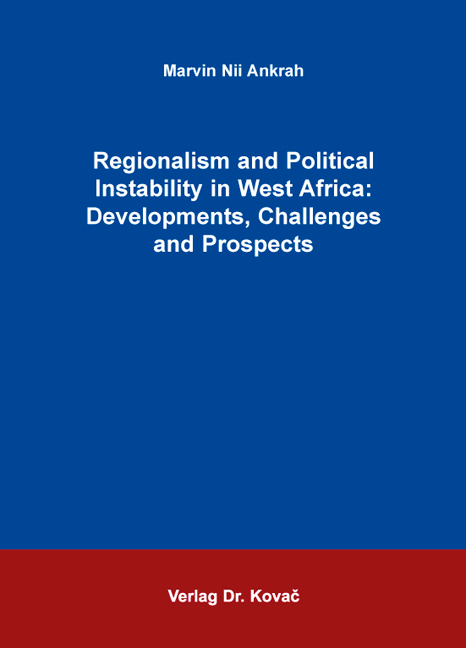 Regionalism and Political Instability in West Africa: Developments, Challenges and Prospects. Dissertation von Marvin Nii Ankrah, Verlag Dr. Kovač 2013, 368 S.
[...] Die Impulse, die von den Integrationsmotoren Ghana, der Elfenbeinküste, der Republik Kap Verde und Liberia ausgehen, lassen selbst so komplexe Problemlagen wie den Drogenhandel und den Terrorismus lösbar erscheinen. Die Voraussetzungen dafür sind allerdings nur bedingt gegeben, wie der Autor mit Blick auf die zahlreichen (innerstaatlichen) Konflikte, die dadurch ausgelösten Flüchtlingsbewegungen und die ökonomische Rückständigkeit klarstellt und am Beispiel Nigerias sowie des Niger-Deltas illustriert. Von daher klingen die in der Vision 2020 artikulierten Zielsetzungen zwar ziemlich optimistisch. Sie werden aber von Ankrah klug kontextualisiert und so in der Realität einer Staatengemeinschaft verortet, die um die Fragilität des Friedens in der Region weiß und deshalb – sehr erfolgreich – eine eigene militärische Eingreiftruppe aufbaut. The study of regions is critical to our understanding of global politics. Post-colonial West Africa has for decades attracted international headlines for many bad reasons. Central among these are various acts of political instability involving military coups, civil wars, irredentists claims, circulation of small arms and weapons and the competition for natural resources. Despite some modest achievements in recent times, post independent West Africa continues to be haunted by other security challenges involving drug trafficking, transnational organized crime, terrorism, paucity in democratic governance and piracy. This book provides state of the art information on these countervailing forces and their effect on regional cooperation and integration spearheaded by ECOWAS, the major sub-regional organization. Undeniably, the past civil conflicts that ravaged countries such as Liberia, Sierra Leone, Guinea and Cote d` Ivoire had a telling direct effect on the constituting member states of ECOWAS. The current Islamists and military insurgency in parts of Mali and Nigeria, drug trafficking in Guinea, Guinea-Bissau, Ghana, resource contestations between Ghana and Cote d` Ivoire and many others continues to divert vital resources otherwise meant for economic development to areas of peace and security. This serves as the driving force behind this work. Establish a direct link between political instability and economic development in West Africa. It advocates for a strong and holistic implementation of the policies and programmes of ECOWAS backed by the much needed political will. Political feet dragging has for long affected the realization of many meaningful protocols and conventions of the sub-region. Laced with traditional theories of integration and rich in empirical data, the book is a vital source of information for policy makers, students of African history and all others interested in the political dynamics of cooperation and integration in West Africa.